Beautiful Hotel inside and out! Thank you for taking your time to share your feedback on your stay at The Westin Crown Center. I am pleased to hear you enjoyed your stay with us and were able to relax and unwind in the comforts of your guest room. We value your business and look forward to welcoming you back for another signature stay. Our beautiful room was spacious and had all the comforts. I had two children with me so even though a king room was all that was available we had no trouble getting a rollaway brought to our room and there was plenty of space for it. I appreciate you taking your time to share your feedback on your stay at The Westin Crown Center. I am delighted to hear what a great visit you had with your children and that you were able to take advantage of all the amenities available to you as our guest. We value your business and look forward to serving you again in the future. We loved this hotel! It has everything you can dream of in one location. All types of stores for shopping and a place to eat for every kind of food you could want. We rarely had to leave the hotel. And the rooms were exceptionally clean with the most comfortable beds! The staff were very kind and helpful. All kinds of things for tourists within walking distance also! Thank you for taking your time to share your feedback on your stay at The Westin Crown Center. I am happy to hear what a great visit you had and were able to indulge in all the great shopping, dining and attractions connected to our hotel. It means a lot our team was able to create a successful visit for you! I have stayed at This Westin several times and I have always had a most welcoming experience with the staff from the moment of check in. Helpful and courteous. Rooms are always very clean and spacious with thoughtful amenities. Loved the new lavender oil for rest! This will always be my first choice even on leisure trips. Thank you for sharing your feedback on your stay at The Westin Crown Center. I am happy to hear what a great stay you had with us and that our staff has consistently made you feel warm and welcome from the moment you arrive. We strive to create as relaxing and refreshing a visit as possible and it means a lot this is the experience you had. We value your loyalty to Westin and look forward to serving you as our guest in the future. Nice hotel, easy to get to, outstanding front desk and bell staff. Nice room and free shuttle service for our dinner was awesome. Was nice to be able to shop a bit at crown center. Unfortunately restaurant and bar were under construction so we did not try. Self park is super easy, I do not understand the negative reviews regarding parking. Look forward to staying here on my next trip to KC. Thank you for sharing your feedback on your recent stay at The Westin Crown Center. I am delighted to hear you enjoyed your stay with us and that our staff was friendly and accommodating, making sure you had everything you needed. I apologize for the inconvenience with the restaurant under renovations. We are so excited to be opening on March 16 and would love to welcome you back to experience the new product. We value your business and look forward to serving you again next time. The hotel had very friendly hotel and valet staff. The check-in was quick and painless. There was very nice hotel decor, with large, clean and renovation room. Great amenities and connected to Crown Center for shopping, entertainment and dining. 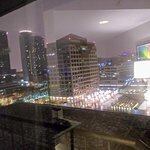 Room tip: Room 1215 (corner King) had a great view of the city and plenty of floor to ceiling windows.